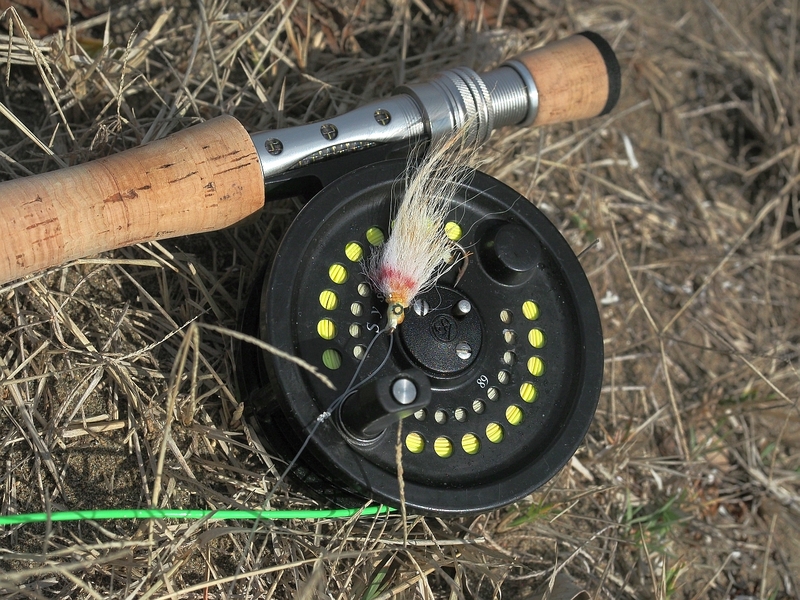 As you probably know I recently reviewed a Kilwell Xantu 9’6” #8 fly rod kindly loaned to me by Kilwell Sports. Jeremy Wells was only too keen to see other anglers try the rod so I leant it to my fishing pal, Mark Hoffman. Mark had a few days off early this week (to recover from his daughter’s wedding) so he decided to head down to a Manukau flat where we’d recently seen kingfish and kahawai harassing bait fish in the margins. Our modus operandi is fairly well developed now. The best time to fish appears to be around high tide, especially early in the morning. If it is overcast or there is a shadow on the water then so much the better. Under these conditions it is possible to fish into the early afternoon and still see big fish hunting. The surface of the water ideally needs to be glass smooth. A slow, stealthy approach coupled with constant scanning of the shallows for signs of fish moving. Stalking the flats is all about economy of movement and patience. Think of it as hunting with a fly rod. In the first session Mark opted to use a crease fly and was rewarded with a huge follow from a fish that he estimated at 12.5 kilograms. The kingfish appeared from nowhere and tracked the fly for about 10 metres before lunging at it in an aggressive last minute strike. Unfortunately the bow wave from the lunge flung the fly in the air and the fish missed its target. “His Majesty” then spun on its massive tail, to showcase an impressive flank, and disappeared elsewhere. Mark apparently took 10 minutes to stop shaking. For some reason the next day Mark was back at the same spot at roughly the same time. Today however he decided to fish with a fly that sank slowly below the surface after it landed. His theory being that this would eliminate the chance of the fly being missed on the strike. Nothing happened for the first hour but it was a stunning day to be flinging fluff. He was soon in that cathartic state where fly casting becomes automatic and metronomic. Suddenly he spied two bow waves heading straight at the shore and directly towards him. Solid bow waves that just screamed kingfish, both moving quickly with malicious intent. As they neared he cast ahead of the fish on the left and started a steady strip. Not a double handed haul, just a quick single handed rip. The fish kept on coming and apparently Mark kept on stripping to keep ahead of the bow wave. About 3 metres from the rod tip the fly got absolutely slaughtered in calf deep water. There was a huge boil and massive shower of saline as the fish felt the hook and headed south to deeper water. The first run took Mark well into the backing. Not deep enough for him to start to fret but at least 50 metres deep. Then the Xantu started to get into its work and he applied side to turn the fish and gain a modicum of control. He was mindful of the small size of the fly (Size 2) and played the fish carefully. He knew he could let it run as we’d scanned the flat extensively at low water and were confident that it was free of obstructions. Long story short, it was an epic struggle and it took Mark 15 minutes to subdue and beach the 75 cm kingfish. This is flats fly fishing at its absolute finest. Apex predators hunting in skinny water that are absolute masters of their domain. Short casts in front of clearly visible fish. It does not get much more exciting than this. Mark kept his hard earned prize as he was keen to discover what it had been hunting on the flats. It contained four baby flounder. Three that were 4 cm long and one larger at 10 cm. This is exactly what Matt von Sturmer has been seeing all summer in his flats stalking around Waiheke. If you have a flat near you where there are lots of baby flounder, mullet and small bait fish visible in the margins at high tide then then chances of encountering kingfish at the moment are fairly high. The Xantu rod performed flawlessly. The 9’6” # 8 weight performs like a traditional # 9 or # 10 weight rod and it is a serious flats tool. Light enough to cast all day yet strong enough to handle most of what we normally see on our flats forays. Both of us are really impressed. I’ve been using an # 9 weight Airflo Ego distance taper on the rod and it casts this line, which has a 65’ head, like a cannon. I was effortlessly getting 90’ into the breeze with a single haul in my last session. I really wish that I’d been with Mark to witness his capture as it would have been a magic experience. The feeling that you get when all your plans come seamlessly together is hard to describe. Well done Mark. Richly deserved.